G3 Set Concept: Dynastieke Attacks! So this Rahi is based off the rhinoceros beetle or dynastinae, I combined it with pepeke which means insect, not the best name but it looks cool. It has about 300 pieces so off the bat it's an expensive set but I would argue this Rahi makes it worth it, 6 limbs with 3 points of articulation, the head with one in the neck and the horn as well as 2 in the wings. The Dynastieke has one rider and 4 stud shooters as well as a function, when the tail is pulled back, the wing opens. For story information, these bugs are used to travel across mountains and through the caverns of Tiro, their wings are not large enough to sustain flight but can be used for large jumps, from mountain to mountain, cave wall to cave wall. The Tiroans tamed the docile animal with ease and are much like large Mahi in their behavior. 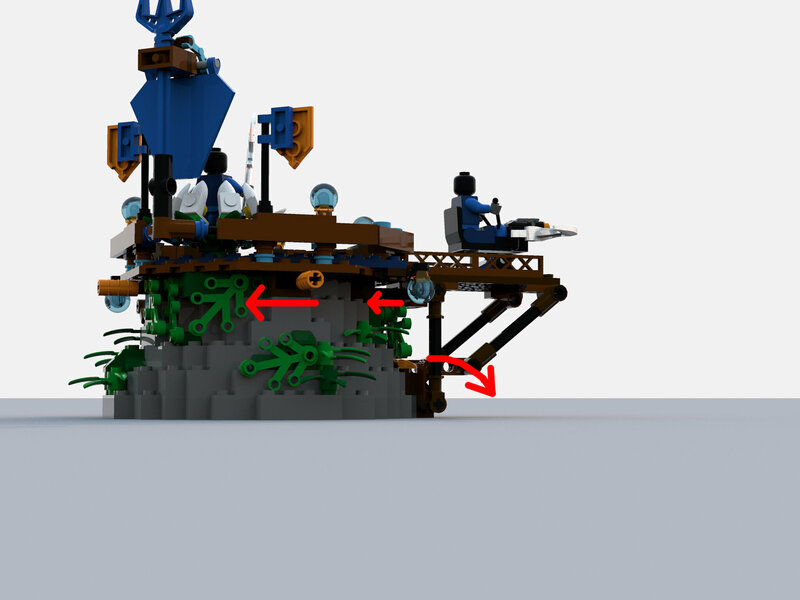 This outpost is on the borders of Naho as one of the small islets and rock outcrops surrounding them, it has 2 turrets and one sentinel (dude sitting in the lotus, kinda like a spiritual warrior-monk or paladin). This also contains a function, when either of the 2 levers on the back are pulled to the side, the wooden struts holding up the turrets collapse into the sea. Again not the most advanced function but it looks pretty good. It's a much larger set than I'd like but I think the Rahi is cool, not really sure if I'll redo this set to make it much better in terms of piece count. I am working on some more Rahi, an ice stag thingy or deer thingy and another large Tiro turtle carrier thing, kinda like an armoured transport Rahi. Not sure if that's gonna be a good set but it sounds cool as heck so I'll probably do it. Comments and criticisms are appreciated as always. Wow, that is one large beetle. Minor complaint, lore based, the Dynastieke in the cover is in the water, but the Rahi is a mountain/underground rahi. Does it know how to swim? Consider me impressed by the size of the rahi though. I mean,not sure about the underground part since tunnels tend to be small as small tunnels require less structural support but I can see this in a ravine or a plateau. Extremely useful for the mega-trees I have seen in the concept art for Tiro. I can also see them as fort nightmares, jumping over the walls and droppings troops inside, while tanking massive damage due to their carapace. Maybe you can make a Kanae variant? Alluding to how Kanae used to be a part of Tiro that floated away. 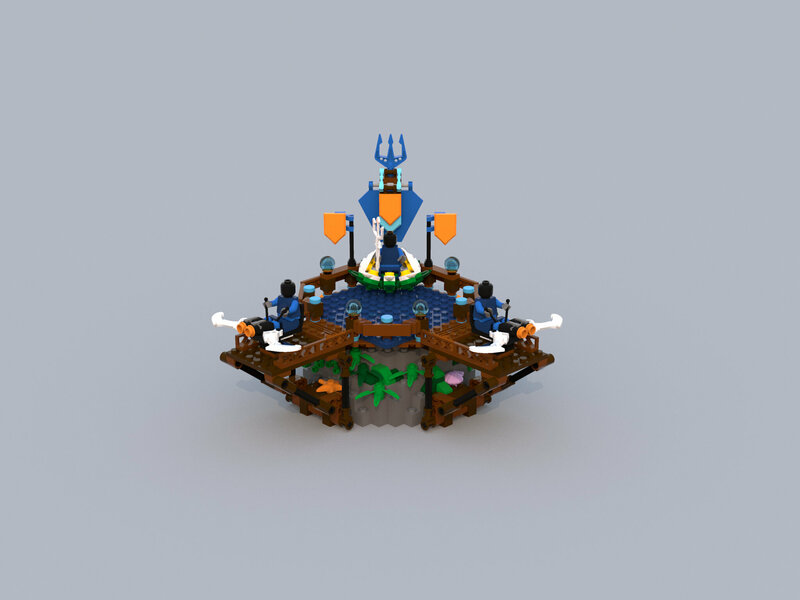 I really like the little tower area, the cliff side and the crossbows are very well done, as well as the flags and trident. 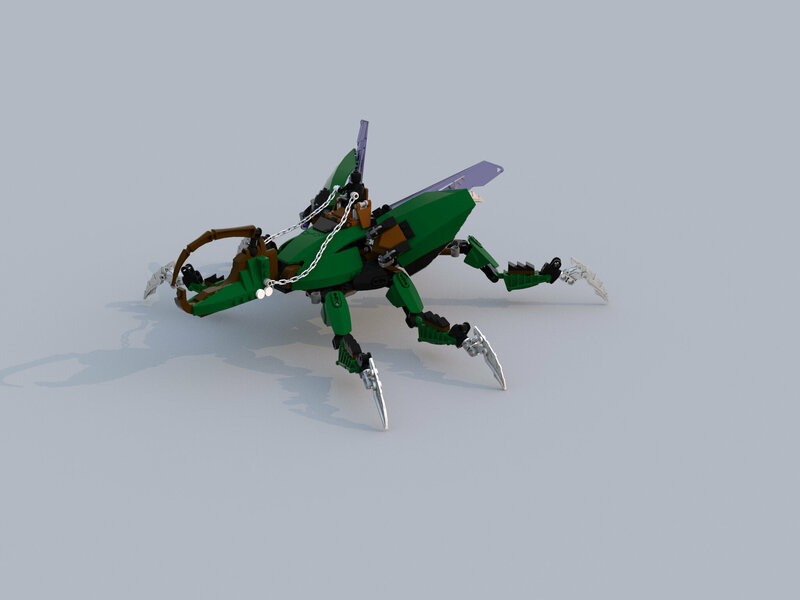 The beetle is okay, but it has very neat functions with the six legs and wings. Oho, that's very fun. The functions and the Rahi are both very neat, I'm glad that we've got more concepts for Tiro Rahi, and those concepts you've mentioned catch my interest, . I'm getting inspired again, but my thesis demands my attention. Curses! To all, thank you so much for the feedback! @odnanref101993 I was assuming it was attacking from the shallows, with only the claws of it's legs in the water, reading up on the Scarabaeidae beetle family, only beetles with certain legs can swim, perhaps I'll make a Nahoan variant. 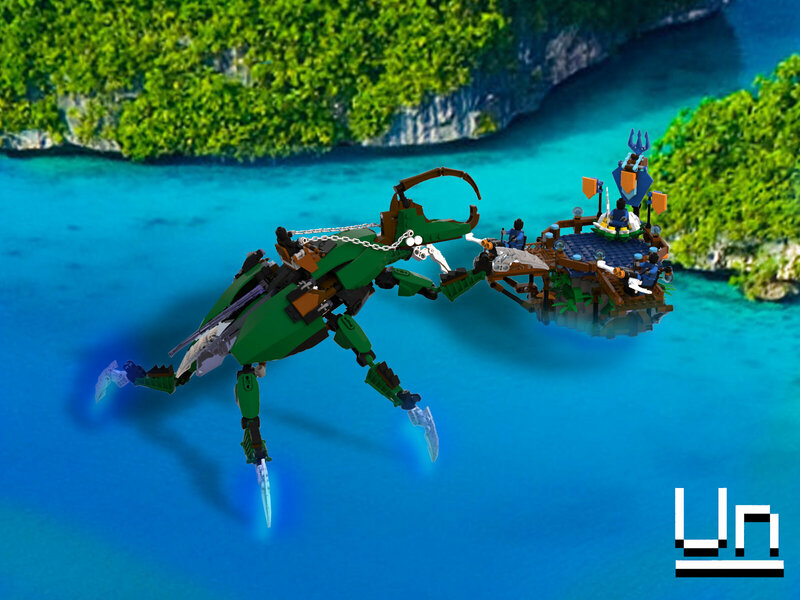 The Kanaean version sounds pretty good, it could be the Galapagos island evolution information but in Bionicle. Edit: I was assuming there is a large cavern/cave system network below Tiro, I'd redo the design for a savanna/plateau to have more brownish covers but that would perhaps be a Motaran version. @ToaNoah_Wafflemeister What happened to your LDD? @Sanokal I know the feeling, I only was able to finish this because I'm on a mid sem break. Thank you oh great one! tbh I prefer your modularity but I couldn't do that here. the set looks great but i worry if the dynastieke would be able to carry its own weight in reality. 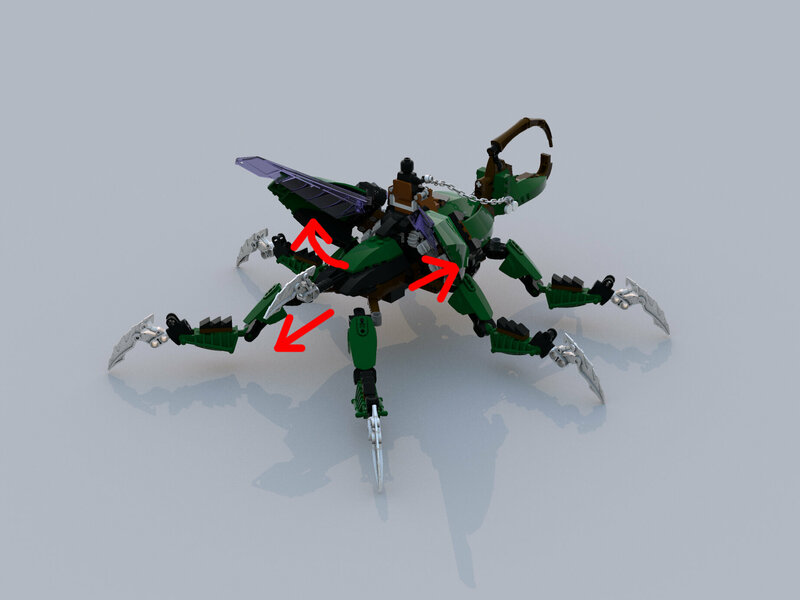 maybe try simplifying the legs into something liftarm based or add some pistons to help with stability. the functions look really neat though. Best case scenario, I'd add the friction pieces from g2 and use a different leg claw piece as that would only be a few extra pieces per leg, to add liftarms would detract from the natural design, pistons would be at least 50+ pieces to the count.